PERU – United Way of Miami County is about $64,194 short of meeting its outcomes goal for the campaign that ends Dec. 31. The outcomes goal was set to reflect the accountability of the United Way system ... In theory, achievement of multiple program outcomes leads to a system objective and achievement of multiple system objectives leads to a community goal. Wallick is encouraging people to contribute even a small donation. Bryan Maggart, the campaign co-chair of United Way of Miami County, said he thinks the biggest contributor to the shortfall this year is from the industrial division. He said changes could leave people feeling unsure about their own financial situation. 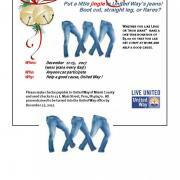 United Way of Miami County is encouraging all of Miami County to participate in United Way Blue Jean Week. The week of Dec. 11 - 15. Employees could make a one-time donation of $5 to get comfy at work and help a good cause.